This is the hardest one to evaluate. I worked more in 2014 than I did in 2013, so I was less worried about money. However, because of my work commitments, I had less time for free time and play than I did the year before. I started giving myself weekly Sabbaths as a way to incorporate more play in my life. Keeping up that habit is harder than I thought it would be; it’s so tempting to skip a week here and there. But I’m definitely happier and have more family time when I stick to taking one day off each week. To be honest, I spend about the same per month as I did a year ago (except for gas, but I can’t take credit for that.) But we do give more to charities and nonprofits this year than we did the previous year. So even if I haven’t drastically changed my spending, I have increased my giving. We’ve also been following Dave Ramsey’s plan for a few years now and made good progress reducing our debt in 2014. 12 months later, it’s still messy. Um, no. It’s still a mess. I did reorganize my coupons last spring and developed a system that really works for me. That’s helped with the day-to-day paper clutter. 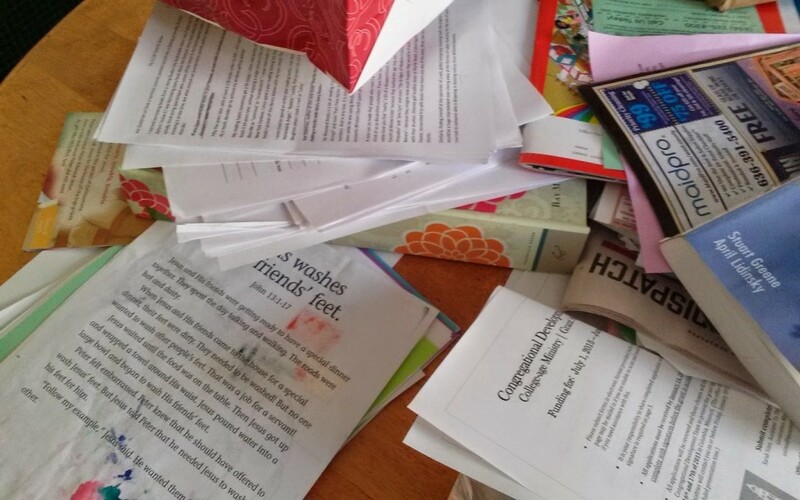 But the big table in my office is still a mess of old (paid) bills, graded student work and handouts, kids’ art projects, printed recipes, sewing patterns, Highlights magazines, etc. However, it’s possible that my messy desk just makes me more creative. So this year I’ll focus on other cluttered areas in the house (so many toys!) and stop feeling guilty about my desk. I haven’t kept track of how much writing I’ve done per month, but I have definitely written more this year. I’ve enjoyed it, too, and want to keep up this habit in 2015. No, but it still sounds like a nice idea, so I’ll keep this one for 2015. I’m pretty much over it; see #3. Adding it all up, I’ve averaged a C this year with my 2014 New Year’s resolutions. I can live with that, but I hope to do better with some of these in 2015. What are your resolutions for 2015?